EBox is the only Ethernet to AS/400 or iSeries solution with full IPDS print-status reporting back to the host. Works with IBM 4247, Printek, EPSON, OKI, Lexmark, and ProPrinter with 9/18/24 pin dot matrix and line matrix impact printers. The only Ethernet to AS/400 Solution with full printing IPDS status reporting back to the host. Works with IBM, Lexmark, Epson, and compatible Dot Matrix Impact Printers. 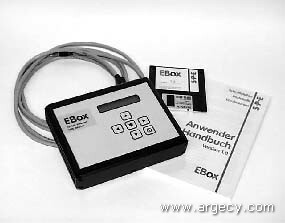 The EBox (matrix) from CSP GmbH allows a line or dot-matrix printer with EPSON or IBM ProPrinter emulation to be seen as an IBM 4224 IPDS printer over a TCP/IP Ethernet LAN. This provides for a simple migration path from Twinax to Ethernet while maintaining full printing functionality and control. The IBM Ethernet connection to the AS/400 or iSeries host provides the same full error reporting and printing control as Twinax. The EBox also supports printing from UNIX, Windows and Novell hosts, allowing the printer to be shared by everyone on the network. The TCP/IP address is set through the LCD front panel. Additional configuration can be done through the front panel or via a web browser. On-board flash memory allows for easy field-upgrades to ensure continued compatibility with future OS/400 and printer releases. Emulation and a special set up selection for the IBM 4247 printer. A new low-cost solution to enable you to have control of your remote IP printer functions similar to a TWINAX printer. Enables IBM AS/400 IP printers to have Page Range Printing and Printer Error Reporting capabilities over Ethernet back to the AS/400. Achieve printing control similar to TWINAX over your TCP/IP network. All of your printers with a parallel port can now be configured on your IBM AS/400 host as a device with a spool file. By using the SNMPDRV Print Server, your remote IP printers will now notify you with an AS/400 console message if they have a problem and cannot print. The size of a pack of cigarettes, the SNMPDRV Print Server attaches directly to the printer's parallel port to notify the AS/400 about the IP printer's status. 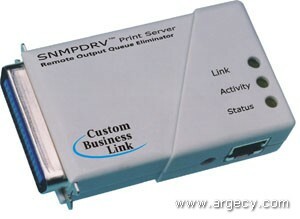 Eliminates the remote output queue method of printing to IP printers. IBM's HPT (Host Print Transform) supports all brands of standard printers e.g. HP, Lexmark, IBM, EPSON, OKI, Genicom, Tally, Printek, etc. Includes all printing technologies: dot matrix, laser, band, line matrix, etc. The printer simply needs to have a parallel port. The SNMPDRV Print Server works with IBM's new SNMP protocol to provide the status of the printer. The AS/400 must have IBM's OS/400 V4R3 or above with all PTF updates for SMNP and TCP/IP applied. Gain control of your printing! IPDS Dot Matrix Interface with Twinax to AS/400. 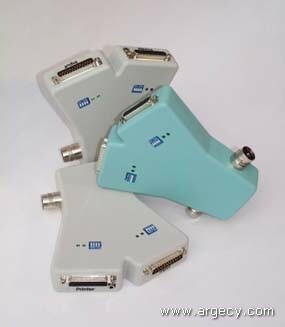 The FBox is a 10/100 Ethernet adapter for laser, matrix, and label printers with parallel interface (IEEE 1284). The FBox as SCS device to the computer IBM AS/400, iSeries and i5 series connected and allows printing via a secure connection. In addition, other protocols are supported for use with other operating systems. In addition to advanced features such as String and Change Font Download forms and macros can also be stored in the FBox. The connection is via TCP / IP, LPR / LPD, FTP, HTTP, DHCP, SNMP, WINS, NetBIOS, and SMTP support PJL. The configuration of the FBox via software tools and an Internet browser with which you can access the configuration pages of the built-in HTTP server FBox. Remote maintenance and diagnostics via the intranet or internet are therefore included as standard. Extensive test and diagnostic capabilities to help with installation and maintenance in a heterogeneous and complex networks. FLASH memory in the FBox and firmware download on the field at any time allow future upgrades and enhancements.